No matter where you live, at least in the United States, real estate is a booming market. Home values across the US are up nearly 10% in the last year. This is great news if you’re a homeowner, and really great news if you’re a real estate investor. But what do you do if the places that you want to invest are in a different part of the country? Or even more stressful, if the home you want to sell or buy is occupied with tenants? What if there were a better way to buy and sell rental homes without having to go through the pain of waiting until tenants moved out, letting the home sit empty for months while it sells, losing rent, maintenance costs, and property value? 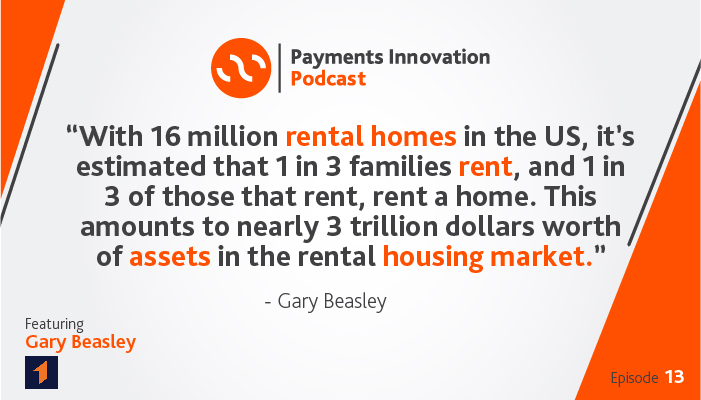 On a recent episode of the Payments Innovation podcast, we talked with Gary Beasley, CEO & CoFounder of RoofStock, about this very thing. His company is changing the game when it comes to real estate investment. The best way to think of RoofStock is like an Amazon.com, but for homes instead of consumer goods. Just like you head to Amazon if you need a book, or a blender, RoofStock is the marketplace for homes. The thing that sets RoofStock apart is that their homes are occupied. The current MLS system works great for homes that are vacant. It doesn’t work well for homes that are occupied. Selling a home is typically expensive, and usually only attracts local buyers, so for sellers, RoofStock is a great option. And for buyers, it allows you to buy a home sight completely outside of your market, because both the home and the tenants have been certified. Selling a home with tenants has traditionally been an arduous process to say the least. You’ve got a lease in place with the tenants, and you’ve got to wait until the lease expires. Then you’ve got whatever maintenance needs to be done to get the house ready to sell. Then the house will sit vacant until it sells and closes. More often than not, a seller will end up spending losing roughly 10-12% of the home’s value. RoofStock handles marketing, certification, and administration costs, for roughly 2.5% of the home’s value, saving buyer’s money, and making the sellers money. On Amazon, you use a traditional credit card or checking account when you want to pay for something. But you can’t exactly just buy a house with a credit card or debit card, so how does RoofStock handle payment for their homes? There are studies currently underway for using things like BlockChain and cryptocurrency for these transactions. While they’re not quite there yet, those innovations are on the horizon, and it’s only a matter of time before purchasing real estate with cryptocurrency will be the norm. RoofStock is currently selling homes all over the country, from coast to coast. The ability to buy homes outside of your local market is a huge bonus, allowing homes in California to sell quickly, owing to booming job market. The biggest growth for RoofStock is currently the Atlanta area, due to the low cost market, combined with phenomenal job growth. Other areas, including Indianapolis, Memphis, the Carolinas, & Florida, are seeing huge growth as well. The real estate market is complex and laborious, often causing a large amount of frustration for buyers and sellers alike. RoofStock is changing the game, and in the process, taking a lot of the headache and pain out of buying and selling homes, particularly homes with tenants already in place. This post is based on a podcast interview with Gary Beasley from RoofStock. To hear this episode, and many more like it, you can subscribe to Payments Innovation.